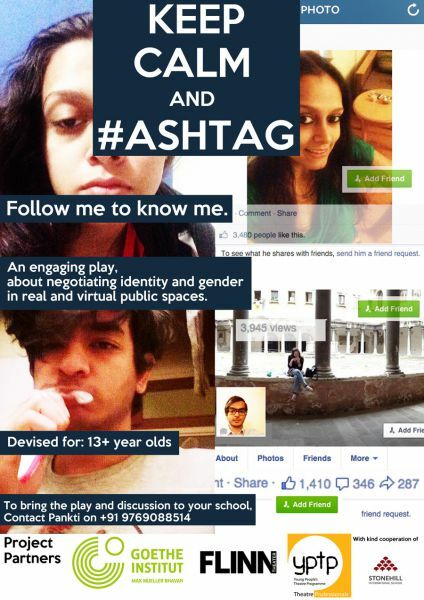 "Keep calm and #ashtag" explores how gender is constructed and reinforced in real and virtual public spaces in the Indian urban context. Cyber space becomes a new public space in which gender plays itself out: Why does Nikhil play an online game as a female avatar? Why does Tanya create an anonymous Facebook profile and what does she do with it? What happens when Sachin’s fighting video goes viral? The play looks at the collisions of real and virtual spaces and the drama that unfolds. The absurd, funny and sometimes painful episodes connect through hyperlinks to a fast-paced ride into the violence of gender construction in teenage years. The play seeks to provoke a dialogue around the complexities that young people face in defining who they are as men and women, and the ways in which they navigate real and cyberspace in their everyday lives. The play is designed to be performed at schools in India and will be followed by Q & A sessions and workshops. Comissioned by Goethe-Institute Max Mueller Bhavan, Mumbai. Produced by Theatre Professionals, Mumbai. In Cooperation with Flinntheater.